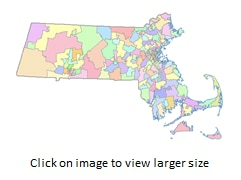 This layer shows the most current State Representative district boundaries for Massachusetts. Search by municipality, legislator, or district name. 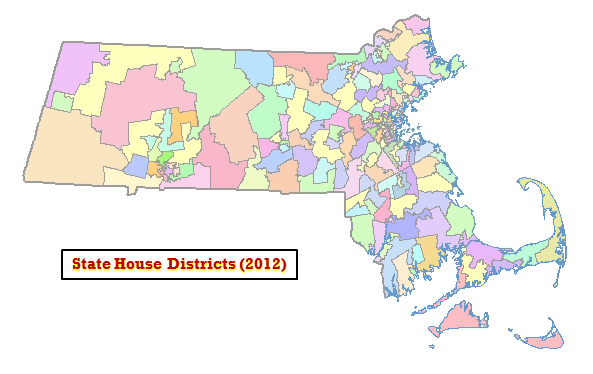 The Massachusetts House Legislative Districts datalayer reflects the state House of Representatives district boundaries as defined by Massachusetts General Laws, Chapter 57: Section 4. These 160 districts are those used in the Fall 2012 elections and beyond, until they are redrawn based on the 2020 decennial Census. The names of the statewide datalayers are HOUSE2012_POLY (polygons) and HOUSE2012_ARC (arcs). These replace the previous HOUSE02_ARC and HOUSE02_POLY layers. Staff at the Massachusetts House of Representatives developed this layer with its contractor, Caliper Corp. (Newton, MA), using Maptitude for Redistricting software. MassGIS appended the 1:100,000 coastline and state outline and added the attribute fields. Election results are obtained from the Secretary of State. In March 2018 MassGIS made minor edits to boundaries in Boston to reflect corrected data from the City of Boston. In November 2018 MassGIS made minor edits to boundaries statewide where they were offset enough from survey-based municipal lines to result in address points being assigned to the wrong district. These boundary changes have not been incorporated into U.S. Census geography that forms the basis for this layer. In January 2019, the layer was updated to relfect the results of the latest elections. Also see the current state Senate and Congress data layers.